Hawaii’s innovative Community Outreach Court (COC) is extending its reach to more communities on Oahu. COC hearings are now held once a month in Wahiawa and the program will soon expand to Waianae. This move to rural courts builds on the program’s success in District Court in downtown Honolulu where COC hearings are held twice a month. The goal since its inception in January 2017 was to take COC into communities around Oahu so defendants would have easier access to the court and would, therefore, be more likely to participate. 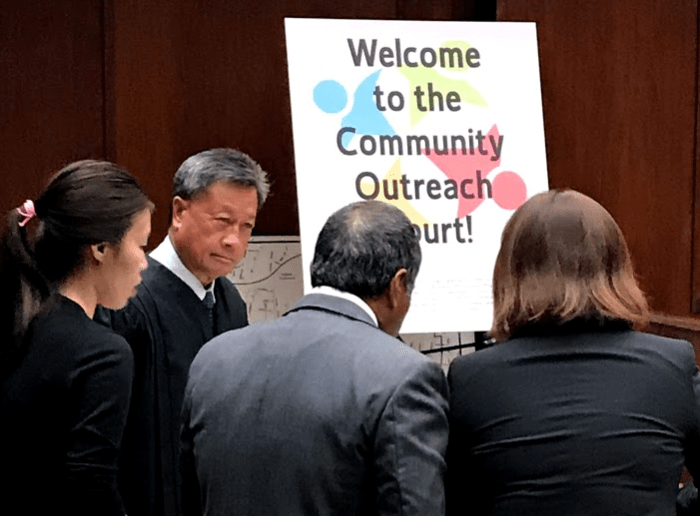 Community Outreach Court was designed to assist people facing multiple low-level “quality of life” offenses and alleviate the congestion in district courts created in part by those cases. During the first 18 months of the program 86 defendants participated in COC, 950 non-violent cases were cleared, more than 1,650 hours of community service were performed by COC participants, and 39 people moved off the street and into housing. Hawaii has the highest per capita rate of homelessness in the nation. As the homeless population has grown, the number of misdemeanor cases involving defendants with limited resources has increased dramatically. Those cases bogged down courts. They utilized a disproportionate amount of resources. In addition, defendants often committed the same offenses repeatedly because they were not offered rehabilitation services. The State of Hawaii Judiciary, the Honolulu Department of the Prosecuting Attorney (Prosecuting Attorney), and the Hawaii Office of the Public Defender (Public Defender) responded by creating a steering committee to find a way to assist people committing the offenses and to ease the increased burden on the district courts. That committee developed Community Outreach Court and thanks to a federal grant, the court held its first hearing in January 2017. The Prosecuting Attorney and the Public Defender review all potential COC cases. Only defendants with non-violent offenses are eligible. Those offenses include violations of park rules and regulations, driving without a license, smoking in prohibited places, drinking liquor in public, and more. Participants are sentenced to community service instead of jail time or fines. Sentences are agreed to in advance by the prosecuting attorney and the public defender. All participants are represented by a Deputy Public Defender and are assisted by a social worker/advocate. Advocates from various social service providers including the Institute for Human Services, the CHOW Project, and ALEA Bridge attend COC hearings. They meet with participants to assist with housing, employment, and other needed services. These advocates work with other social service agencies such as the Economic Development Center of Parents and Children Together, the Oahu Jail Diversion Program, Catholic Charities, Waikiki Health, Kalihi Palama Health Center to address a myriad of participants’ needs. The agencies and advocates equip participants with tools they need to move forward in their lives.